Funfair is in town! Plush dolls are waiting for your rescue! 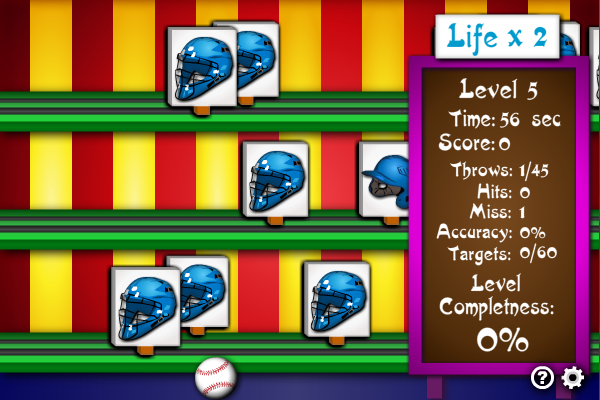 In this game, the player use the mouse to throw baseballs to knock down moving targets inside a stall at the funfair. Pay attention to valid targets before each round, and avoid shooting down any non-targets. The goal of the game is to complete all levels without hitting too many wrong targets. Help Santa Claus deliver Christmas gifts to the houses! Can you put the gifts right into the chimneys? Your hometown of Vandor is mysteriously destroyed. As the soul survivor you set out on a wild adventure to find your missing master and answers to the mysterious destruction of Vandor. Would you phone a number seen on your tele for a free holiday? Are you fit enough to pass the gym tests? Against the Odds is an Island jungle adventure in the same style as A Day in the Life with all the comic possibilities.